The trailer for this year's Ghostbusters reboot, which was always going to be met with contempt from fans of the beloved original, has now become the most disliked film trailer in Youtube's history; and even with positive critical reviews continuing to pop up, hatred from the fanbase remains intact. The apparent overly feminist themes, cheesy modern humour, stereotypical black character, and apparent tired, repetitive gags the trailer demonstrated kept the backlash escalating to insane new levels, and with the film now released in the US, it's average box office earnings have certainly reflected on this wave of negativity. But is this all really deserved? Ghostbusters has the same premise as it's 1984 namesake, but with new character backstories and motivations, and a number of different takes on the subject. 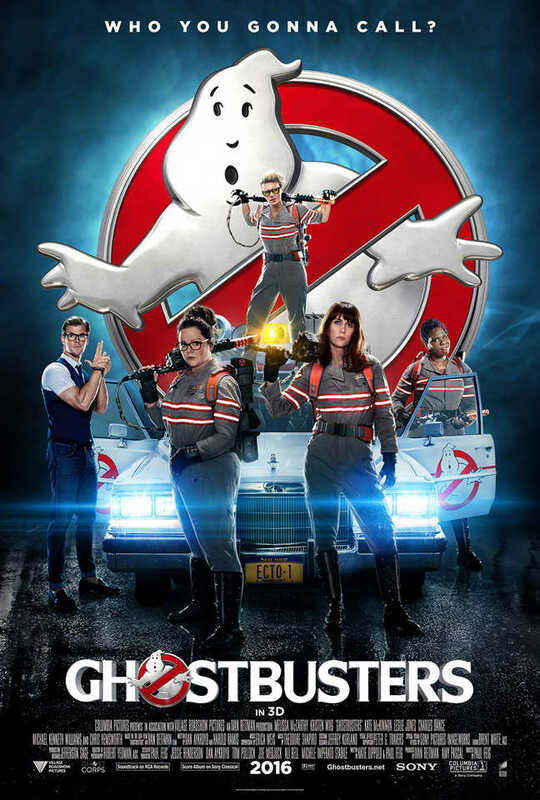 When reunited with her long time friend and book co-writer Abby (Mellissa McCarthy), Erin (Kristen Wiig) returns to her beliefs in the supernatural and joins her and Jillian (Kate McKinnon) in the inception of a ghost catching business; a venture on which they are joined by Patty (Leslie Jones), energetic former subway worker and their first ghost-busting recruit, and Kevin (Chris Hemsworth), their slow yet loveable receptionist. With their business in place, things get off to a bumpy start, and it soon becomes apparent that the few ghosts lurking around New York City link up to something far more sinister than initially thought. The original film is a classic that nobody wants to see ruined. But this modern take on the idea is undoubtedly poorly advertised - at least in some ways - and so rendered in a negative light, when in actual fact it's a solid modern comedy that pays respect to it's spiritual predecessor whilst adding fresh ideas of it's own. The use of an all female cast never feels overly patronising or a forceful feminist ideology - it just feels like we have four female protagonists, the majority of whom all perform with plenty of spirit and energy. Whilst Chris Hemsworth's loveable yet somewhat idiotic male character may sometimes feel like an offensive stereotype to some, looking past such overly sensitive ideologies reveals him to be full of comedic appeal and, if anything, I find the main weakness to be how underused he is. When it comes to Neil Casey as the film's villain, his somewhat vague development and underwritten morals cause a little bit of initial confusion, but the deadpan performance flawlessly coincides with the witty dialogue he is given, resulting in an enjoyable antagonist with a strong finale. The use of modern CGI effects of course doesn't have the same mindblowing appeal as the original, and there are times when it could've been a little more polished, but the end results are still fun to watch - especially during the final act. The central issue is that, despite it's enjoyable nature, Ghostbusters really doesn't bring anything new to it's genre and and often lacks strength when it comes to character development - which is even more problematic when Leslie Jones' role doesn't branch away from the stereotypical behaviours demonstrated in the trailer as much as we'd desire. With this in mind, a well chosen overall cast, vibrant visuals, and a welcome sense of fun ensure this is a pleasing modern take on a classic film which, even if it can't match said original, is a nice surprise considering how dreadful it looked at first glance.